Atwood is a very old surname, of Anglo-Saxon origin, meaning “someone who lived by a wood.” The first recorded spelling in 1243 of the family name is shown to be that of Thomas Attewode whose name was recorded as a witness in the “Assize Court Rolls of Somerset,” during the reign of King Henry. 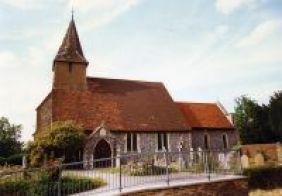 Many of the Atwood families in America today have ancestral ties with Sanderstead, Surrey, England and All Saints’ Church which has stood there since the 13th century. The Parish Church Cemetery is the final resting place of many of the family. The earliest monument found in the Church today (dated 1525) is that of John Attwoode and his wife Dyones. 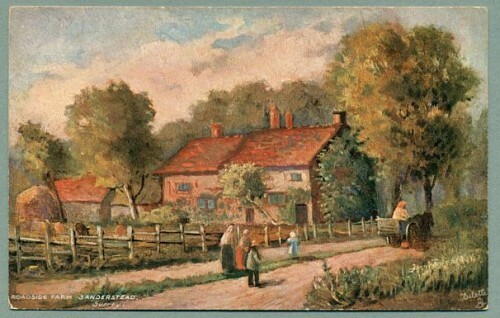 The manor house, known as Sanderstead Court, was home to the Atwood family. It is estimated that this large country house was constructed in the early 16th century. The Atwoods and their descendants occupied the house for about three hundred years. It was used as a hotel in 1928, and before World War II, it was used by the Royal Air Force. It received fire damage in 1944, and was later demolished in 1958. James Atwood (1769-1816) – plantation owner from Laurens County, South Carolina and wife Polly. William James Atwood (1792-1861) and wife Elizabeth Ann Miles – first settlers of Stien’s Creek in Webster County, Missouri. Thomas Jefferson Atwood (1823-1882) and wife Matilda Hough – Indian fighter and cattleman. William Payton Atwood (1849-1917) and wife Ellen Elizabeth West – Missouri to Texas – early settlers of Cross Plains, Callahan County, Texas. William Riley Atwood (1879-1952) and wife Hattie Francis Havins. Thomas Orvil Atwood (1910-1952) and wife Vira Lorene Grantham.